Fourth Row Center: Film Writings by Jason Bailey: On DVD: "Do The Right Thing: 20th Anniversary Edition"
On DVD: "Do The Right Thing: 20th Anniversary Edition"
Spike Lee was thirty-one years old when he made Do the Right Thing, but it was only his third feature film; his first, She’s Gotta Have It, was an indie sensation, while its follow-up, School Daze, proved a profitable urban hit in spite of mishandling by Columbia Pictures. 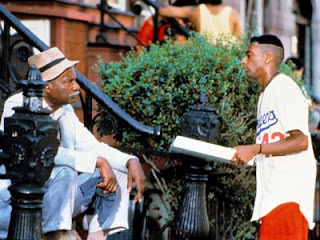 That film, and Do the Right Thing, were financed via the “negative pick-up” method—once the studio (this time, Universal) approved of the script, they agreed to finance and distribute the film, with the understanding that the director would stay within budget and basically shoot the script they had all agreed upon. The upside for the director was that this meant little to no studio interference during shooting, and the right to retain final cut. So the suits at Universal left Spike Lee alone, and he went off to paint his masterpiece. And Do the Right Thing is just that: smart, nuanced, energetic, and entertaining, taking on giant issues on a miniature scale and with a sure hand. Set on one block in Bedford-Stuyvesant in the heart of Brooklyn almost entirely on a single day (the hottest day of the summer), its hub and focus is Sal’s Famous Pizzeria, owned and operated by Sal (Danny Aiello), a gregarious Italian-American and father to Pino (John Turturro) and Vito (Richard Edson). They work in the pizzeria with him, along with Mookie (Lee), the delivery man and neighborhood crier. In and out float a rich assortment of characters. There’s Da Mayor (Ossie Davis), an older black gentleman who wants little more than to impart wisdom and enjoy a beer every now and again; his nickname is somewhat mocking, but he takes it seriously. Mother Sister (Ruby Dee) also keeps watch over the neighborhood from her stoop and front window—she and Da Mayor have an antagonistic relationship that hides real feelings. Mister Senor Love Daddy (Samuel L. Jackson, in one of his first roles), the disc jockey for WE-LOVE radio, broadcasts a running commentary from his windowed studio and provides the soundtrack for the block (and the film). That soundtrack is occasionally interrupted by the blasting boom box of Radio Raheem (Bill Nunn), who roams the streets like a panther, Public Enemy’s “Fight the Power” the only song worthy of his speakers. Mentally challenged Smiley (Roger Guenveur Smith) walks around selling copies of the famous photo showing the only meeting of Malcolm X and Martin Luther King Jr. Three middle-aged men (Paul Benjamin, Frankie Fasion, and the late, great Robin Harris) sit in lawn chairs on the corner and act as the film’s Greek chorus (their patter and patois infuse a spirit of low burlesque comedy into the proceedings). And there’s more, many, more: the girlfriend, the sister, the b-boys, the little kids, the cops, the Korean couple that owns the corner store, all there, all part of the tapestry. And then there’s Buggin’ Out (Giancarlo Esposito), the rebel without a clue, who stumbles on a cause when he notices, for the first time, that the “Wall of Fame” in Sal’s Pizzeria has no African-Americans on it (only iconic Italians). Sal and Buggin’ Out do not see eye to eye on this point, and that minor disagreement, over the course of the long day, becomes about much more than pictures on a wall. Watching that scene for the first time in several years, I was struck most by how much Aiello’s brilliant work in the film has been taken for granted. Yes, he got an Academy Award nomination, but many saw that as an attempt to give the film some recognition (it was inexplicably shut out of the Best Picture and Best Director categories, though Lee’s screenplay was nominated as well). But Aiello is superb—boisterous, earthy, natural, and believable. There’s something just perfect in the texture of the pizzeria scenes, and in the way Aiello relates to his sons (and his employee) there. You buy his affection for the neighborhood and his pride when he notes that these people grew up eating his pizza, but he’s also shown enough flashes of his temper that, when it gets the best of him at the film’s end, it doesn’t feel like a construct; it’s heartbreaking and infuriating at the same time. Lee juggles the rest of the large cast expertly. Turturro is spot-on in capturing the disgust and angry contradictions of the racist Pino, while Edson’s more sympathetic Vito is engaging and casually funny. Davis and Dee are just plain marvelous; both effortlessly convey the weight of their characters’ experience, and their off-screen marriage imbues their snippy encounters with just the right amount of subtle affection. The neighborhood kids are lively and fun to watch, though I’m not sure why Martin Lawrence (in his film debut) chose to play his character as if his tongue was swollen to twice its size. It’s only in the female characters that Lee’s screenplay fails him (as often happened early in his career)—aside from Mother Sister, they’re pretty weak. Mookie’s baby mama Tina (played by Rosie Perez in her film debut) is shrill and one-note (though some of that may be the actress), and the thin character of Mookie’s sister Jade is given little flavor by Lee’s real sister Joie (her weak performances were another ongoing issue in his early filmography). There are a few other minor screenplay fumbles. Occasional scenes feel forced and overwritten, like Da Mayor’s confrontation with Lawrence’s crew or Radio Raheem’s monologue explaining his four-finger LOVE and HATE rings (a too-winking homage to Night of the Hunter). Lee has an occasional tendency to signpost his dialogue; in this more sensitive screenplay, that’s less of an issue with political views than it is with poor exposition (surely there’s a better way to communicate Mookie and Jade’s relationship than with a line as awkward as “Don’t you love your brother Mookie?”). And while I appreciate his eleventh-hour decision not to have Mookie scream “Howard Beach” (an allusion to one of the recent episodes of New York racial violence that inspired the picture) before tossing that controversial trash can, playing a scene in front of graffiti reading “Tawana Told The Truth!” feels like he’s stacking the deck; the film’s strength is that it traffics in observation over judgment. And there is one moment of shockingly poor film technique, a walk-and-talk between Lee and Edson in which they start to talk before they walk (I’m not sure why this error wasn’t fixed in editing). But those are minor mistakes, and none detract from the overall punch of the picture. This is, by far, the most even, clean script Lee has yet written—it is episodic in nature, but it flows smoothly and effortlessly from scene to scene, building subtly to a cumulative effect. Lee says more than once in the bonus materials that this was the first time he really felt confident when making a movie, and that confidence shows; this is an assured, thrilling act of high-wire filmmaking, and he takes full advantage of the entire compliment of cinematic devices. There is the famous racial epitaphs sequence, in which characters deliver piercing inner monologues straight into a dollying camera; it’s an ingenious way of moving bubbling subtext into the forefront. He uses montages throughout the film, but it never feels like lazy storytelling (as a montage can so easily be)—it’s shading, adding to the feel, part of the fabric. And the climax concludes with one of the most effective cuts-to-black in all of film. He also gets career-best work out of cinematographer Ernest Dickerson, whose images (full of tropical, fiery, vivid color) are lush and gorgeous. The film is pleasurable just to look at—the smooth camerawork, the knockout compositions, the jaunty dutch angles. But they’re also not showing off; there’s a quiet scene where Sal and Pino sit at a table in the pizzeria, in front of a large window, and talk plainly and simply to each other (you can hear the regret in Sal’s voice when he asks his eldest son, “Why you got so much anger in you?”). There’s no visual pyrotechnics here—it’s done all in one, in a single, unbroken take that pushes in slowly and subtly on the two men. That scene concludes with an unexpected and difficult altercation with passing Smiley, and underscores the film’s other, perhaps most considerable strength: seldom have I seen a film that gives off such an impression of life happening outside the frame. So often, in disposable pictures, we can all but see the stars eyeing their off-screen trailers; Do the Right Thing was shot, interior and out, all on that one block in Bed-Stuy, and characters are constantly ambling through the backgrounds, passing through and engaging in offhanded interactions. Radio Raheem’s boom-box battle with a group of Hispanic guys ends with a lovely boom up to a wide shot—and there’s Da Mayor in the corner of the frame, grabbing a quick nap on a stoop. Smiley’s always working the block, trying to sell his pictures (the character wasn’t even in Lee’s original screenplay; actor Smith lived nearby and kept coming to the set to try and work his way into more scenes). And it wasn’t until this viewing, preceded by countless others, that I noticed Vito and Pino in the background of the fire hydrant scene, washing Sal’s Caddy. Life is happening on this block; the camera is just trying to keep up. But what is most remarkable about Do the Right Thing is how finely shaded each and every important character is, and how all of those shadings come into play by the time the film reaches its breathless conclusion. Any movie that can do that, and also contain as much warmth and humor and life as this one, deserves all of the accolades it has received, and then some. Twenty years after its release, Do the Right Thing has lost none of its considerable power; in fact, from this vantage point, it seems strangely prescient of the riots that followed the Rodney King verdict three years later. But it’s not just a polemic—Spike Lee’s film is sharp, juicy, and thrillingly alive, and it pops so good in high-def that I’m afraid even those who owned the (previously) definitive Criterion disc may have to spring for the double-dip. The new "20th Anniversary Edition" of "Do The Right Thing" hits DVD and Blu-ray on Tuesday, June 30th.